In this article you’ll learn about 13 high return on investment ways to use data to improve your training and racing performance. I’ll show you specific examples of how I use data-driven training in my own training and for athletes I coach. Feel free to copy my methods exactly, or adapt them to suit your needs. I’m a big advocate of using the Training Peaks software platform for planning and analyzing your training so many (but not all) of these tips are specific to Training Peaks. Training Peaks offers both free and premium accounts that are worth every penny. I suggest you sign up for a free account and try it out for a while, and if you like it and want to get the full benefits of data-driven training, then you should definitely upgrade to a premium account. Enjoy the article! A prerequisite for data-driven training is knowing your current fitness level in all three disciplines. To improve fitness, you must have an appropriate progression of your training workload be part of your training program. In other words, you have to induce the right dose of training load or training stress on your body, and this dosage should be progressive. You can measure training stress and use this knowledge to manage your training load progression (see point 2). However, measuring training stress accurately requires you to know what your fitness level is in each discipline. Although there are some variations in terminology, essentially you’ll always assess your fitness level in terms of functional threshold pace in swimming, functional threshold power (FTP) or functional threshold heart rate in cycling, and functional threshold pace or functional threshold heart rate in running. A 400 m and 200 m swim time trial to calculate your Critical Swim Speed (functional threshold pace) in swimming. See the exact protocol and plug your times into the calculator here. It’s critical that you reassess your fitness regularly. I recommend doing it at the very least every 8 weeks, but during times of the season when you progress a lot (such as during the base and build phases) every 6 weeks or even every 4 weeks is preferable. If you don’t reassess regularly, not only will you be potentially doing a lot of your training at incorrect intensities. But all the rest of your data-driven training efforts and analyses will be wasted, since everything we measure in data-driven training is based on your functional thresholds. Traditionally when mapping out a periodization plan for a season, athletes and coaches have been combining quantitative data like weekly training hours or weekly distance (in running and cycling) with qualitative “thoughts and ideas” about what kind of training to do in which period. This is a good approach, but it has some flaws. Primarily the fact that it’s very difficult to know whether any given planned progression of training duration will work in practice when training intensity changes as you move through training periods. These days you can get around that problem by using Training Stress Score (TSS), which takes into account both duration and intensity of training to periodize your season. So if you periodize by TSS, you can go into every new training week knowing that the week before that you managed a similar workload. You don’t have to worry about doing too much or too little training as your distribution of volume and intensity shifts. It’s all accounted for in the TSS. You can get an estimate of the TSS of every workout in your training plan, as long as you know it’s duration and have an estimate of its intensity as a percentage of your functional threshold. This is all pretty easy to learn, it just takes a little time and effort up front. The image below shows and annual training plan based on TSS. You can see that the weekly TSS increases gradually until three weeks before as the athlete’s goal race (with the exception of recovery weeks every third week). Knowing the target TSS for each week allows us to tailor the athlete’s workouts to meet the target TSS each week. It’s all well and good planning and and periodizing by TSS, but you should also assess your actual completed training, and see whether you’re hitting your target TSS. The image below shows how this athlete has done that very well so far in her periodization. As a result, her fitness is progressing very well, but not too fast (this would lead to a high risk of injury, illness and overtraining). Understanding the Performance Management Chart in Training Peaks is key to understanding how your training is progressing. This is your average Training Stress Score over the last 6 weeks. Obviously, the higher this average, the fitter you are. Keep in mind that it’s still all relative to where you started. Having a higher CTL than another athlete doesn’t mean that you are faster than the other athlete. But if your CTL is steadily increasing (as in the image below) then you are getting fitter. Same as fitness, but this is the average TSS for the last 7 days only. So if you made a big increase in training stress over the last week, you will see a big increase in fatigue, whereas a slow and steady increase in training stress will keep your fatigue more level. TSB is simply the difference between fitness and fatigue. During periods of heavy training, TSB will be negative (sometimes quite a lot), because even though you might be very fit, the amount of recent training stress greatly reduces your freshness. However, once you reduce your training load, fitness might decrease only slightly, but fatigue will decrease a lot (since it’s a one-week average instead of six-week average like fitness), which means your form will quickly increase. During your training and up until your taper, you want to see a general trend of increasing fitness. In this period, your form can and should be low, and your fatigue can be high. Not constantly, though. Take rest days and easy weeks to counteract that. Once you start peaking for a race, you want to decrease your training load so that your fitness decreases just a little bit, but your form increases a lot. This means your ready to race. Don’t worry if your fitness is not constantly increasing. It’s absolutely necessary to accept periods where it decreases slightly. These periods, an easy week every fourth week for example, are what rejuvenates you so that your body can the adapt to the stress you put on it once you get back to progressing your training load. What the PMC does in this case is help you determine how much rest and how easy training is just enough, so you don’t do too much and end up carry too much fatigue, but don’t do too little and end up losing too much fitness either. If you plan your training using TSS and pay attention to your PMC, you should see a steady increase in fitness (CTL), Just how rapidly your CTL increases is known as your ramp rate. Obviously, it’s nice getting fitter faster, but if you do too much too soon you’ll be flirting with injury, illness and overtraining. That’s why keeping an eye on your ramp rates is crucial. In the image below, you can see that this particular athlete has a ramp rate of 3.4 CTL over the last 7 days, and a CTL of 71. This can be considered a conservative, low-risk ramp rate. Low risk ramp rate is 4 or less if your CTL is 45 or less, and 6 or less if your CTL is 70 or more. Moderate risk ramp rate is between 4 and 6 if your CTL is 45 or less, and between 6 and 8 if your CTL is 70 or more. High risk ramp rate is 8 or more if your CTL is 45 or less, and 10 or more if your CTL is 70 or more. But remember, these are just guidelines, and at the end of the day, it is you or your coach that needs to find the sweet spot that works for you. Your aerobic endurance is essentially your “base fitness”. Your ability to keep going for a long time at a relatively low intensity (around 80% of your functional threshold heart rate). How do you know whether your base is good enough or if you need to keep working on it? By measuring your decoupling and efficiency factor. Here you can see that heart rate (red line) follows pace (green line) very well. There’s only a very small increase in heart rate towards the end of this workout even though the pace stays the same. The decoupling here is 3.01% (decoupling is “Pa:Hr” in the right sidebar). In the Triathlete’s Training Bible, author Joe Friel states that aerobically fit athletes have a decoupling of 5% or less. When you see this low a decoupling in your longer workouts, you can be confident that your aerobic endurance is where it should be. While heart rate doesn’t necessarily increase, it stays quite constant while the pace seems to drop towards the end of the workout. This results in the greater decoupling, and is a sign that aerobic endurance should still be a focus for this athlete. A second way to measure your aerobic endurance is by using the efficiency factor (EF). EF is simply the distance you can cover per heartbeat, so a higher value is better. In Training Peaks, EF takes terrain into account, since it uses a calculated normalized graded pace as input for the EF calculations, and not just regular pace. Note that EF is not comparable between different athletes, since different athletes can have very different heart rates for the exact same effort. The way you can use EF to assess aerobic endurance is by comparing similar workouts you’ve done over time, and check your EF trend. The workouts should be done at a steady pace and at a low to moderate intensity. Ideally, select a route that you can repeat in the exact same way every couple of weeks at a similar effort, and monitor your EF for this workouts. As long as EF keeps increasing, your efficiency at aerobic intensity levels is increasing, and you still have gains to be made. But once your EF starts plateauing and no significant improvements have happened over the course of several similar test workouts, it’s a clear sign that you’re close to maxing out on the gains you can make from this kind of training, and it’s time to move on to the next training phase. The efficiency factor is highlighted in the two images you already looked at for decoupling, with the first one showing an EF of 1.68, and the second one an EF of 1.48. Muscular endurance is in simple terms your ability to push moderately high (tempo or zone 3 efforts) to high intensities (up to threshold efforts) for extended time periods. Your muscular endurance plays a huge part in determining how fast a triathlete you are. Since it’s such an important ability for all triathletes, you should be monitoring it closely. During the periods of the season when your goal is to increase muscular endurance you should be seeing a steady increase in certain key metrics that indicate increased muscular endurance. If you don’t, you have to take some time to analyze whether you need to change something up in your training. The key metrics I recommend you track are P20 and P60. These metrics show the best average power you have held in training (or racing for that matter) for 20 and 60 minutes on the bike, and the best average pace you’ve held for 20 and 60 minutes on the run. For power, you can see a clear trend of increasing P20 and P60, indicative of increased muscular endurance. For example, the last 3 complete weeks show a progression of 192, 202, and 220 watts for P60. For running the picture is less clear, and P60 is completely lacking from 3 weeks ago and for the month of October. For P20, data is available, but not clearly increasing. This is a sign that we need to keep an eye on the run training and start seeing a progressions soon, or otherwise we may need to change things up a bit. Things like fitness assessments (FTP tests and the likes) and races can skew these data. If that happens, you may want to filter out dates when you raced or did your assessments to get a more realistic overview of your muscular endurance. My favorite part of the Performance Management Chart is how it allows you to take much of the guesswork out of tapering and peaking for goal races. Let’s make one thing clear. You WILL lose fitness when tapering, and that’s perfectly fine. Your freshness (form) on race day will more than make up for it. Generally speaking, the longer your goal race the more CTL you can and should probably lose. To give you some rough guidelines, up to at most a 10% loss of CTL might be ok for an Ironman goal race, but for an Olympic distance goal race up to 5% would be more appropriate. Form (TSB) on the other hand should increase, but not excessively. You can only raise your TSB so much before the decrease in fitness will be too much and the balance is off. The reference values for TSB is between 0 and 20 on race day. But, as with anything in triathlon, this is highly individual. Try to find a narrower range that seems to work really well for you, and then try to get TSB to that personal sweet spot in future races, while minimizing your CTL loss. Let me illustrate with an example PMC, where I’ve marked where peak fitness occurs relative to race day, and what happens to CTL and TSB in between these two time points. This athlete was preparing for an extreme Skyrunning race. It was 32 km long, but with 2500 m of elevation gain and with it being very technical, this was an almost five hour long event, so comparable to a 70.3. The athlete’s CTL peak happened 8 days out from the race. CTL was 72.6 at this point, and TSB was a negative -5.8. Taper had already started, but it obviously takes a few days before the trends start turning. On race day, CTL had dropped to 65.6, so a 9.6% decrease in CTL. TSB on the other hand, had increased to 11.1, right in the middle of that 0 to 20 reference range. This athlete ended up having an excellent race, so for future races, we now know with more certainty what to shoot for when we plan the taper period for goal races. This is another trick I learned from Jim Vance’s Triathlon 2.0. It applies specifically to 70.3 and Ironman racing, as for those distances your “big days” of training (long ride, potentially followed by brick run) start to play a big role. Note that you need to have a fairly realistic estimate of what power output is required to achieve your goal time. For example, let’s say your FTP is 250 W and you want to ride the Ironman bike leg at 70% of FTP. That’s 175 W (0.7 times 250 W). Then you can have a look at roughly what average speeds you’ve been holding for training rides at that power, and extrapolate that to the Ironman distance. Of course, this assumes that the terrain is fairly similar, that there aren’t extreme wind conditions to account for, and that you ride with about the same overall weight (rider + bike + nutrition) and aerodynamics. For example: let’s say you’ve been training with the right setup on similar terrain as the race course, and you tend to average 31 km/h in speed at 175W. Then you just divide 180.25 km with 31 km/h and get a time estimate of 5.81 hours, or 5 hours 49 minutes. For the 70.3 distance, you can add about 5% to these reference values. If it makes more sense to you to work off target watts rather than target intensity as a percentage of FTP, you can do that just as well. Let’s say you think that 170W is what you can hold for the bike leg. Then your target intensity is simply 170W divided by 250 W (the example FTP), in this case 68%. All right, so now we are at the final calculation: getting your estimated TSS for your goal race bike leg. This is a high TSS value. Jim Vance recommends those who just want to finish shoot for a bike TSS of 220-260, midpackers for 240-270, and very competitive age-groupers for 270-290. But let’s roll with it. Build your long ride up towards the goal bike TSS, and include longer and longer segments of riding at race intensity to see if you can handle it. If not, perhaps you need to re-evaluate your goals. And finally, you should try to run off the bike at target run intensity to make sure that you’re not burning all your matches on the bike. Reference values for run intensity (again from “Triathlon 2.0”) for the Ironman are 70% to 80% for midpackers and 75% to 85% for competitive age-groupers. Add 5% if you’re targeting a 70.3. Even if you don’t do extremely long brick runs in training (for most athletes long brick runs are way more risk for it to be worth any potential reward), you’ll probably be able to tell even based on a 30 minute run off the bike at target intensity whether it’s a realistic target or not. If it isn’t, was your bike too hard, is your run intensity target too high, or do you just need to keep training your ability to sustain that pace? These are the questions that reverse engineered race-specific workouts help you answer before the race, so you can make any necessary corrections to your race plan or to your training in time. TOP TIP: The power (Watt) values used in these calculations are all normalized power (except for FTP). Normalized power takes variations in power output into account. If you ride perfectly evenly your normalized power equals your average power for a ride, but given that there’s always some degree of variation present, you can expect normalized power to be around 2% to 5% higher than average power. The difference may be even bigger for challenging courses with a lot of climbs, descents and turns. Comparing your key performance indicators over time allows you to objectively assess how your current season is progressing, and how you’re doing this season compared to previous seasons. We already talked about this to some extent in sections 5 and 6 for aerobic endurance and muscular endurance specifically. In those cases, we monitored how decoupling, efficiency factor, P20 and P60 developed over time within a season. After a completed season, it’s very useful to compare these metrics, and other key metrics (see the next section for my most recommended metrics to focus on) not only in-season, but also from season to season. Was your decoupling significantly better this year than last year, and could you notice that in your race performances? Was your CTL (fitness) clearly higher for your goal races this season than last, and how did that translate to results? What about TSB (form). How did it develop in-season? Did you get sick or injured at some point when it dropped too low? Did you find a TSB sweet spot that seemed to give you the best performances on race day? These are some examples of questions you can ask yourself around your data. A thorough analysis at the end of the season where you chart out these comparisons and write down your conclusions can help a lot in planning even more effective training for next year. In the images below you can see a couple of visual examples of what kind of analyses you can do. Since we’ve passed the 4000-word mark I’ll keep this section short and sweet. I’ve just added my list of top-recommended metrics to focus on in your data-driven training, and a brief description of what to do with each metric. Remember, there’s no point just collecting data and looking at data for the sake of it. You need to actually use data to help you make smart training decisions, and focusing on too many metrics won’t help you do that. It’s more likely to just overwhelm you. 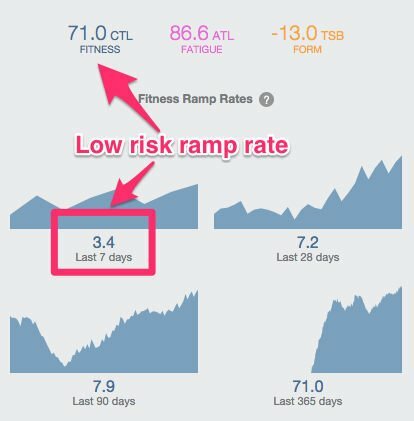 Monitor CTL (aka Chronic Training Load aka Fitness) in your performance management chart (PMC). You want to see a generally increasing trend (see image), although small drops are allowed and expected during easy weeks, taper periods, and a large decrease will inevitably happen in off-season. It’s useful to monitor CTL for swim, bike and run combined, as well as separately for the bike and the run. As with CTL, you monitor TSB in the PMC. There are two things to look for with TSB. Make sure it doesn’t get to below your individual threshold for high risk of injury, illness and overtraining. It’s impossible to say exactly what this threshold is, you need to find it out based on experience. Get it in the 0 to 20 range on race day for your A-races. And with experience, you might be able to narrow that range down even further. Keep an eye on your weekly TSS and IF (intensity factor - your average training intensity as a percentage of your functional threshold). Depending on where you are in your season, you may want to increase one or even both of them, but you need to make it a controlled increase. We talked about decoupling (your heart rate drift compared to power or pace output) and efficiency factor (EF, your distance covered per heartbeat) in detail in section 5, so refer back to that section for more explanations. The takeaway message is that until your decoupling is 5% or less for your long, steady, workouts you still have a lot to gain from improving aerobic endurance through relatively easy or moderately easy training in relatively high volumes. When you get below that 5% mark, though, it’s probably time to start focusing on some more intense training to improve things like muscular endurance and VO2max. Another sign that you’ve maxed out on long slow distance training is that your EF has stagnated and isn’t improving any more in your steady workouts at low to moderate intensity. Lastly, as discussed in section 6, you should track P20 and P60 (the best average power/pace you’ve held for 20 and 60 minutes) to see where you are in terms of muscular endurance. This is especially important in the build period of your training program, when you’ve started to incorporate muscular endurance workouts. If you’re P20 and P60 are not improving in this phase, then something’s up and you need to figure out a way to get back on track. Training Peaks is an amazing platform to easily collect, analyse and use training data in all the ways we’ve discussed in this article. One of my favorite features in Training Peaks is the ability to completely customize your dashboard to get a quick overview of all the data that’s important to you and your training. If you’re completely new to data-driven training, I realize that this can be a bit too much information to digest all in one go. But I hope that you realise how massive potential benefits data-driven training can have on your triathlon performances. If you do, and you need some more help and clarifications on these topics, don’t hesitate to send me an email and I’ll be glad to help you get started. Good article! How do you include non-training related factors (work, travel, lack of sleep, other stress) into training plans and these measurements, i.e., things that on age grouper might create significant load outside training (esp. concerning recovery)? Are there any practical tools to assess true recovery and advice to modify training program when “real life” interferes with the training program? Sometimes it is very difficult to assess whether the reason for not wanting to go riding on the indoor trainer is due to laziness or body’s real message about insufficient recovery? Especially when in general training (also on trainer) feels fun. I think that HRV is becoming that practical tool and objective measurement that’s very good at assessing recovery, albeit not perfect. In my podcast episode Heart Rate Variability (HRV) for triathletes with Dan Plews | EP#42 we cover the topic in detail. Really good article! Thanks ! Thanks for a great post! I am wondering should I include strength training workout TSS or stick to swim, bike and run. From other sources I can find recommendations for and against. I understand that TSS is developed for biking and can be extended to other endurance training, but strength training is something different. For me it does not matter if it is included or not, but how to interpret weekly/season target TSS that are needed to achieve certain fitness on race day? If I include strength training will my tss be falsely highly and thus fitness lower than planned? And if I don’t include it, will I overtrain more easily if following TSS? Thank you, glad you liked the post. My suggestion is that it’s up to you, you can include it or not, as long as you stay consistent with how you do it. 1) In case you don’t include, then you’ll just need to consider your available “TSS-bank” a bit lower when in periods of more strength training than it would be if you were just swimming biking and running. For example, if you could do 500 TSS per week of swim, bike and run in the base phase of your program, but you’re also concurrently doing 2 x strength sessions per week in this phase, your available TSS-bank for swimming biking and running might drop to 420 TSS or so. This helps with the potential issue of overtraining. You can guesstimate 1 hour of strength training to equate to 40-50 TSS (at least that’s what I do. 2) In case you do include strength training TSS, I recommend not focusing on the “All workouts” PMC, but rather, create PMC:s separately for biking + running, biking, running, and swim + bike + run (in that order of importance). Because otherwise, yes, your PMC might indicate a better fitness for triathlon than you actually have. Personally, I tend to use option 2 for athletes doing focused strength training of at least 2 times per week in the base phase. If the athlete does only 1 gym session, then I don’t really bother with TSS for it, but merely try to balance the hours and duration of training any given week, and also of course consider the order of workouts within any given week.